Rikhabdev is situated 65 km of Udaipur in Rajasthan. 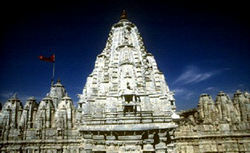 Rikhabdev is a religious town associated with Jainism. The antiquity of its existence cannot be determined with exactitude. However, three inscriptions have been traced which recorded deed of piety and repairs during the 14th and 15th centuries. Rikhabdev is well known for its Adinath or Rikhabdev temple, which attracts thousands of pilgrims from all over. The deity is worshipped by the Hindus as well as the Jains. This entry was posted in Rajasthan, Rikhabdeo and tagged Kesariyaji Temple. Bookmark the permalink.